A fantasy sword with some bite! Our Fantasy Warrior series combines full tang functionality with never before seen blade shapes. Hand polished stainless steel bolsters surround the black pakkawood handle. Two steel pegs secure the 440 stainless steel blade. Includes nylon sheath with strap. 17 1/2 in. blade, 24 1/2 in. overall. Just got it in the mail. Great sword! Great price! The test of a true battle blade is whether it feels like an extension of your body/mind/spirit. This is an instrument of the silent warrior. Once you hold this blade in your hand you will know you have made a sound investment and discovered another dimension to the SELF. At what price do you buy such an opportunity? This was one of the first things I bought from BudK and I can honestly say I am happy I did. Came out of the box INCREDIBLY sharp and very well balanced. The only gripe I had was that the handle could of been a little bit more beefy. But all and all a very good sword that I enjoy very much. Just unwrapped it. It's very formidable. Very sharp and easy to handle. I will have to make a better sheath, but for now the zipper scabbard will do. Once again, very happy with BUDK on both the quality and price. Thanks again. At first I was skeptical as the reviews seemed too good for a $20 sword. Im glad I was wrong! This sword is AWESOME! Pros: Amazongly sharp Great Weight Great quality BudK normal fast shipping Pakkawood handle is really nice Only issue I have is that dried oil look on the blade. Get this! I can cut up sides of beef and logs too with this thing. BLEEPIN' AWESOME!! this is a great buy the sword came sharp, looks hella cool and i could not argue with the price. it looks awesome and would be terrifying to any person or zombie that had to face it. i u admit that the sheath is kinda wierd because of the zipper.but if u leave the zipper halfway down you can jus release the button and pull the sword. an when u place it over your shoulder and pull it the blade comes out facing you. but a quick spin of the sword an your ready for whatever coming your way. mine came today and i am completely happy wit it. for 20 bucks you cant beat that get it while its hot. This blade is the best 25 dollars you will ever spend. Razor sharp, and straight. Nice grip and easy to point. 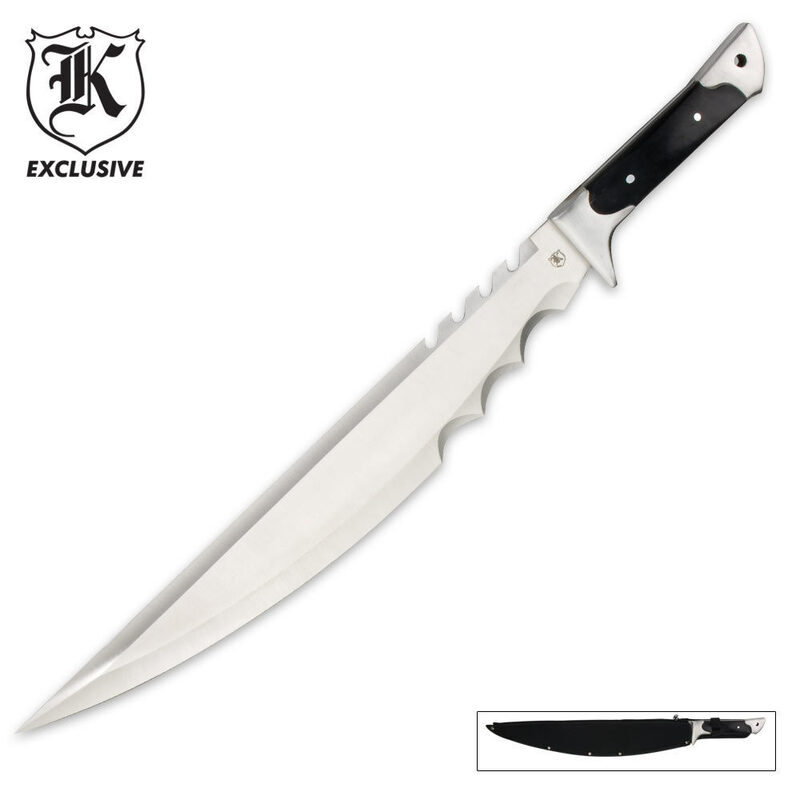 The blade is not flimsy, I would say firm,(not a machete on purpose)and strong in the handle. I only have one use for it. If you get one...you will know what that use is. The sheath is only used to cover the blade, so not to cut yourself. We all have to work the sheath issue out. This is the best Bud K brand blade I have purchased. If used for the purpose designed, you will smile. Five stars, even with the the zip up crazy sheath. Happy it came wrapped in something. Use wisely. This thing is just plain awesome. At first, I was a little worried about how it would look, feel, and perform in person. It arrived yesterday, and I am VERY impressed! Right out of the box, it was REALLY FRIGGIN SHARP! So sharp, in fact, that I nicked myself just opening it (and I am experienced with safely handling blades). The only drawback I could possibly think of is the handle is just a little bit slick. Some people don't like the sheathe, but I love it. There is a zipper running all the way down the side. I think this is because if you were to just try to slide the blade out, it would cut through the sheathe! Now, I haven't had this for a long time, but the sheathe DOES seem very durable. Most of the weight is in the blade, so if you're considering buying this for hacking through branches, burglars, etc. You are in the right place (the tip is also demonically sharp). It's a perfect length, and just looks and feels bada**! Combat, camping, display, this could be the ideal sword for any situation. Thanks BUDK!! !